Acne seems harmless—pesky but harmless until you suffer from a chronic or severe form of it. Then, it starts to affect your life in serious ways. Mental health can suffer, and one's confidence can drop dramatically. On top of that, some cystic acne is downright painful. No one knows that better than Kali Kushner, a young woman suffering from chronic acne. She shares her story and skincare tips on her Instagram account, looking to help others who are working their way through similar skin issues. According to Cosmopolitan, her side-by-side photos are going viral around the internet thanks to the dramatic transformation they show. Now, she credits her clear skin to a lifestyle change and the prescription medication Accutane. As you can see from her photos, her skin has changed quite dramatically from what it used to be. "I had always had some minor acne in high school, but one month in 2014, it went full-force crazy, covering my entire face," Kushner told the magazine. "I tried literally everything: the oil cleansing method, which is where you wash your face with oil, the caveman method, which is where you don't put anything on your face at all, plus every cream, potion, and antibiotic that my dermatologist prescribed me, but nothing worked." It was at this point that she started working with her dermatologist to get on Accutane, which is an oral prescription medication formulated to clear severe acne. "It was honestly like magic," she said. In fact, her skin began to clear in a matter of weeks. But it wasn't without side effects. "The only downside was the side effects, which, for me, made me dry literally everywhere, and made me feel achey all over, all day long, every single day. It'd take me ten minutes just to get out of bed in the morning, because my back was so sore." Kushner's skin has since cleared considerably, though she still updates her Instagram (which has 23,000 followers, by the way) with new skincare finds, tips, and inspiration. "Acne is so hush-hush and shamed in society, and having clear skin is the epitome of beauty, so if you dare have a spot or a breakout—and if you dare to take a picture of it—it's almost like something's wrong with you, which is so false," she said. "People think you have acne because you're dirty, or you don't wash your face, or you're just generally unkempt, but it's about hormones, blood sugar, and genetics, more than anything else, and yet people look down upon it as if it's something you're not trying hard enough to fix, which is what I try to dispel in my Instagram." Now, she uses a combination of vitamin C and micro-needling to do away with old acne scars. We can attest to the magic that is micro-needling (which is why we have a complete guide to our favorite skincare habit). If acne is an issue for you, definitely follow her. 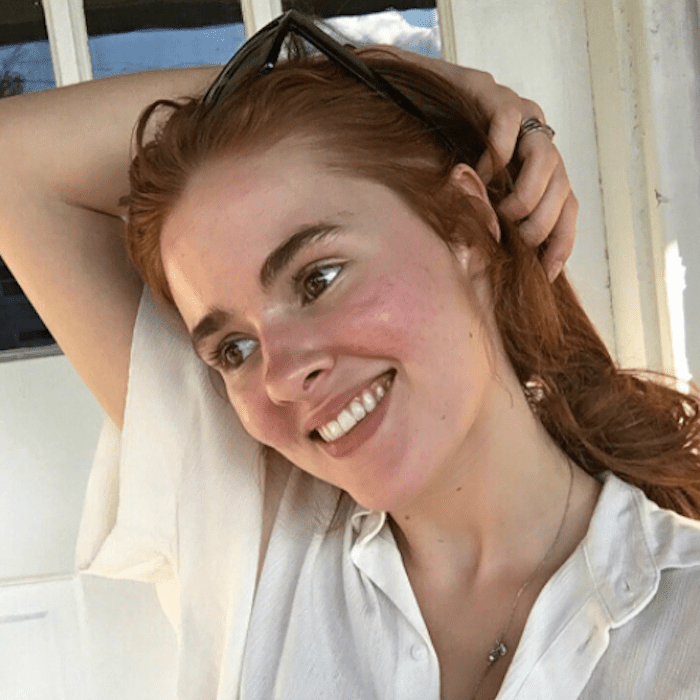 She is wise beyond her years, saying, "I'm genetically predisposed to acne, so I've come to learn that my skin will have its ups and downs, and it might get better or worse some months, and that's nothing to be ashamed of. I know it sounds cheesy, but you are so much more than your acne, and if you want to go on Accutane to make yourself feel more confident, then do it, but do it because of you, and not because you're trying to look like this perfect image that matches our perfect standards of beauty." Head over to Cosmopolitan to read the full article. Then, read up on the science behind Accutane and what it actually does to your body.